Is Eating Meat a Healthy Choice? That being said, it may not be time to go strictly vegetarian just yet if meat is an important part of your diet. As long as it’s enjoyed moderately and you stick to leaner options like fish and poultry (especially grass-fed or organic varieties), eating meat is a great way to pack loads of healthy compounds into your meals. Meat is certainly one of the best sources of protein around, which leads to improved muscle and brain function. And the protein in meat is “complete”, unlike that in plant sources – in other words, it contains all of the amino acids that are essential to life in just one source. Iron from meat is easily absorbed by the body, and meats are high in vitamin B12 and zinc, which can be harder to get in the proper amounts from plant sources. And when it comes to Omega-3 fatty acids, oily fish like salmon, herring, and tuna can really pack a punch in delivering this heart-healthy nutrient, which can also help decrease inflammation within your body and lower your cholesterol. There’s no easy answer, unfortunately! Even within medical journals, the jury remains out in terms of whether a vegetarian or omnivorous diet is better for your health. While one 2010 study, published in Nutrition in Clinical Practice, found that vegetarians had lower BMIs, better cholesterol and blood pressure levels, lower rates of heart disease, and less incidence of chronic illnesses ranging from diabetes to many types of cancer. But, the same year, an article in the Archives of Latinoamerican Nutrition found that there was no statistical significance to any differences between vegetarians and meat-eaters when it came to indications of cardiovascular disease, as long as lifestyle and overall calorie intake were similar. In terms of health, it’s clear that red meat, especially, can do significant damage to your health if eaten in large quantities, resulting in heightened risks of cancer, heart disease, and overall mortality. However, if eaten as part of a balanced, healthy diet, moderate amounts of lean meats like fish and poultry can help deliver high-quality protein, crucial vitamins, and beneficial Omega-3 fatty acids. In the end, it comes down to what foods make you feel the best, and what meshes well with your lifestyle. So, what do you think – should you eat meat? 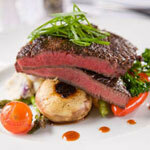 Latest Headlines » Nutrition » Is Eating Meat a Healthy Choice?